Don Juancho carefully studied the production methods employed in Jamaica, which at the time set the world standard for the manufacture and appreciation of rum. He would also draw inspiration from the islands of the Antilles, discovering and improving upon many of their distillation and aging secrets. The sugar mill, with its traditional method of crushing the sugar cane, was a both trusty tool and a constant companion to Nieto Meléndez. He would observe its slow work in the same way a traveler might explore a map in search of new destinations, imagining the endless variations he could create by combining different cane juices in his rums. 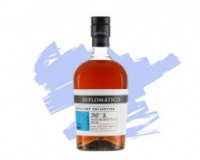 The result was a rum that combined an unmistakable character and body with irresistible and subtle aromas, the triumphant expression of his untiring search for a spirit that would go on to captivate the world under the name Ron Diplomático. His search for an exclusive flavor, color and aroma worthy of being served at the world’s finest venues is a living testament to his extraordinary tenacity and dedication.